If you haven’t yet discovered the wineries and breweries of Elgin County and Norfolk County, you are missing out on an amazing collection of award-winning wineries and craft breweries.The amazing wines reflect the history and character of the area, the fresh hard ciders feature locally grown fruits from area farmers that enjoy long, warm growing seasons, and the exceptional craft-brews feature local hops and flavours. Whether you’re a fan of wine or prefer beer and cider, you have to give the Toast the Coast Trail a try! Take a look at these videos from our insider Next Stop: Taste culinary series to get a peek into the passion of the winemakers and brewers on the trail! While Quai Du Vin Estate Winery produces over 90,000 bottles of wine each year, it’s the blends that hold a special place in Winemaker, Jamie Quai’s heart. 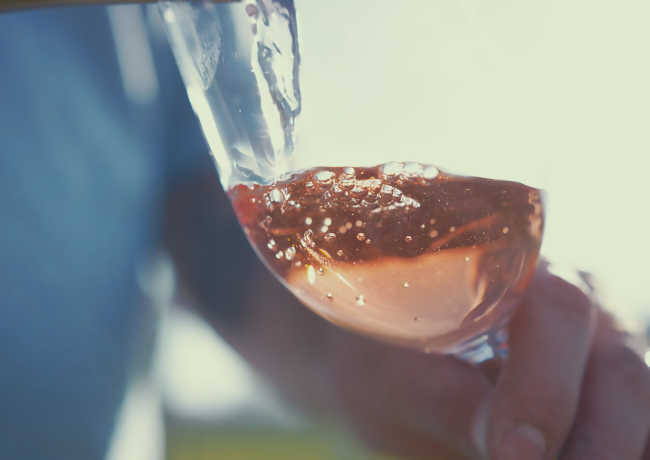 Enjoy a glass of his Saignée, a light, aromatic rosé on their Wine Press Terrace on your next trip. As you start you tasting travels to these fabulous wineries, you&apos;ll want to pick up special single day Tasting Voucher. For $10, you can enjoy free tastings at all the wineries on the trail for a full day! Railway City Brewing Company has quickly grown from a single-car garage you-brew facility into a thriving craft brewery creating hand-crafted beers and inspiring an intense sense of hometown pride in the community of St. Thomas. Come out on Fridays and grab wood-fired pizzas right at the brewery! Need a place to rest your head before you make your way from Elgin to Norfolk to continue tasting the South Coast Trail? Check out the Kettle Creek Inn or Telegraph House in lovely Port Stanley. Truly local craft beer starts with locally grown hops. Ramblin’ Road Brewery Farm has that with all of their hops grown right on site making it Ontario’s only brewery farm. Take a tour and see the hop garden while you enjoy some of their own beer battered potato chips. Bonnieheath Estate Lavender and Winery is a treat for all the senses. Relax and breathe it all in with a glass of their delicious wine or cider, shop for lavender luxuries made right on site and stroll and smell your way through the fields of purple blooms. In a nod to Norfolk County’s tobacco-producing past, Burning Kiln uses former tobacco kilns to dry grapes for their award-winning Appassimento-style wines. All summer long, take in the views from their patio and taste amazing dishes made from local ingredients too. While visiting the area, you’ll definitely want to visit the waterfront. Spend a night at Bayside Vacation Resort right by the water; or for a bed and breakfast experience, check out Palm Trees and Polar Bears B&B. New Limburg Brewery specializes in refreshing Belgian style ales. Drop by the brewery, which is located in a renovated school building, and enjoy samples of their hand-crafted brews on the patio or in an old classroom complete with games and chalkboards. There’s live music weekly too! Got your taste buds tingling? Visit the full Toast the Coast Trail with even more wineries and breweries along the north shore of Lake Erie. To check out even more amazing culinary stops across Ontario’s Southwest, check out the full Next Stop: Taste video series.